This blog post was first published on Bloomberg’s website at https://www.bloomberg.com/professional/blog/uncovering-value-evolving-sustainability-space-conversation-csrhub/. When CSRHub was founded ten years ago, sustainability wasn’t considered a key part of corporate or investment strategy. However, the company’s core team believed that corporate social responsibility (CSR) was a strong indicator of value and a tool for stakeholders to reliably measure it would soon become a necessity. To meet this growing need, CSRHub created a comprehensive ESG (environmental, social, and governance) rating system to evaluate companies’ performance, based on an innovative Big Data aggregation and normalization model. These rankings are now available on Bloomberg via the APP Portal (APPS ESGH <GO>). 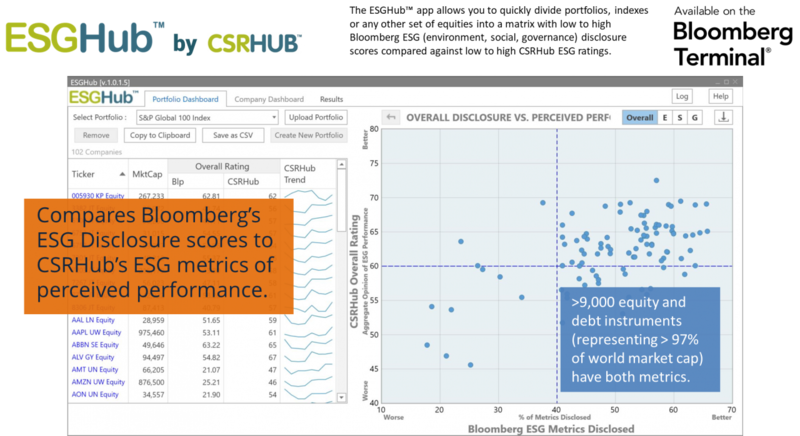 Bloomberg recently spoke with Cynthia Figge and Bahar Gidwani, CSRHub’s CEO and CTO, to discuss the company’s origins, the wide-ranging value of their ESG rankings, and the future of corporate sustainability. How did CSRHub find its niche in the market and work to expand its reach? In 1996, Cynthia Figge cofounded EKOS International, one of the first sustainability-related consulting firms in the US. After ten years spent working with a number of major companies, she recognized a need for a broad, consistent measure of corporate sustainability performance. With this in mind, she recruited Bahar Gidwani, and the two started CSRHub, bringing her vision to life. Bahar had previously founded Index Stock Imagery, the world’s first electronic photo repository, pioneering several of the technologies required to categorize and distribute large, disparate data sets, so he was comfortable dealing with the complexities of ESG data. Cynthia and Bahar believed that CSRHub could be both an attractive commercial opportunity and a means for improving corporate sustainability, so they committed to making the company a B Corp—a “benefits” corporation that has both a profit-driven and a public service mission. What sets your ratings system apart in what is becoming a more crowded sustainability market? Hundreds of groups attempt to rate various aspects of corporate sustainability performance. CSRHub has aggregated more than 550 sources and more than 5,500 different types of sustainability measurement into a simple, broadly comparable set of ratings. While other ratings systems assess only a few hundred to a few thousand companies, CSRHub covers more than 18,000 entities. Other rating systems tend to have huge amounts of “not known” or estimated data elements, while CSRHub has complete ratings on more than 8,500 companies—97% of world market capitalization. What is the benefit of operating as a neutral provider? Rather than pushing a particular view of what is “good” or “bad” about a company’s sustainability performance, CSRHub provides a consensus opinion. It normalizes its ratings so they can be compared across industries and geographies. Users of CSRHub’s system can then compare their own views or those of other data providers against a strongly supported consensus view and look for systematic misperceptions and biases. How have you tailored your systems to appeal to the greatest variety of clients? We allow each user to create a profile that expresses his or her own “weight” for each area of ESG. With this in mind, we also provide the ability to adjust ratings for special issues such as the use of animal testing or GMOs in an entity’s products; involvement with regimes such as Iran or Burma; and participation in coal or nuclear power. Each user’s ratings can be uniquely tailored—a reflection of the world as he or she believes it should be seen. With Fintech continually evolving, how does CSRHub stay ahead of trends and deliver new solutions? We must constantly incorporate new ways of measuring corporate sustainability. We have consistently updated our back end data management technology to keep pace with the growth in our coverage, data feed, and customer base. Fortunately, there are strong tools available now for supporting a business such as ours, including MongoDB, AWS (Amazon Web Services), Ruby (for our web servers), and JSON (for our Application Program Interface or API). Where do you see opportunities in the ESG space? We look for areas that are poorly organized and understood, but that may be tied to longer-term corporate value. We have connected our data to brand strength, risk, the cost of debt, the value of corporate reputation, and the quality of a company’s communications. For data to be valuable, it must be relevant to both human behavior and corporate strategy. What were some challenges faced in the company’s early days? We needed to have multiple sources (more than 50) for many companies (at least 5,000) before we could test, tweak, and validate our algorithms. It was initially hard to explain that our system didn’t rely on companies’ self-reported data or on the work of human analysts. Other ESG rating systems started with either publicly reported data or questionnaires sent to a company’s management. Some systems simply tracked and stored each data item they received. Others used analysts to evaluate each data item and turn it into a score. Each source had its own methodology and each assigned its own weights to the factors it considered. By focusing on aggregating opinions, we were able to generate a broader, deeper set of ratings. We also isolated ourselves from being directly influenced by companies’ self-reporting patterns. This has prevented our scores from being “greenwashed” by companies who seek to make themselves look good by reporting a lot of unsupported facts. How has CSRHub’s position as the broadest and deepest global ESG and sustainability rating and information platform been beneficial? Our platform increases visibility and awareness of both the ESG ratings of companies and the availability and utility of a wide range of ESG data sources. We believe we are contributing to the development and growth of sustainability measurement in general. What are some questions you frequently receive from clients? Our financial clients need help aggregating, interpreting, and using ESG ratings to uncover value and improve their decision making. Our corporate clients are interested in improving their own ESG ratings to better manage multiple stakeholder perceptions of their sustainability. We help both investors and companies find the “signal” in disparate data sets and guide them to generate value from ESG strategies and implementation. How did you build a partnership with the Bloomberg App Portal? We have been interested for years in Bloomberg’s effort to collect and organize sustainability data. The Bloomberg ESG Metrics team has built the industry’s broadest (9,000+ companies) and deepest (~900 indicators) set of company-reported data. We wanted to combine our aggregated opinion information with a strong source of company-based facts. Bloomberg users had access to selected data from several major ESG data sources, but they couldn’t easily extract and combine this information with Bloomberg’s ESG Metrics. We believe Bloomberg’s users will enjoy the combination of the ESGHub app’s simple visual map and CSRHub’s coverage of almost all the companies in Bloomberg ESG Metrics. It has been a pleasure to finally bring together these two data sets and two lines of work. How have your customer needs changed in recent years? Corporations have developed many programs for improving their ESG performance, in part responding to investor and other stakeholders’ demand. ESG staffs are growing in both size and sophistication. In our capacity as entrepreneurs, we have listened closely to our customers and worked to anticipate trends. We have had to steadily improve our products and tools to maintain the company’s primacy and continue to meet customers’ needs.